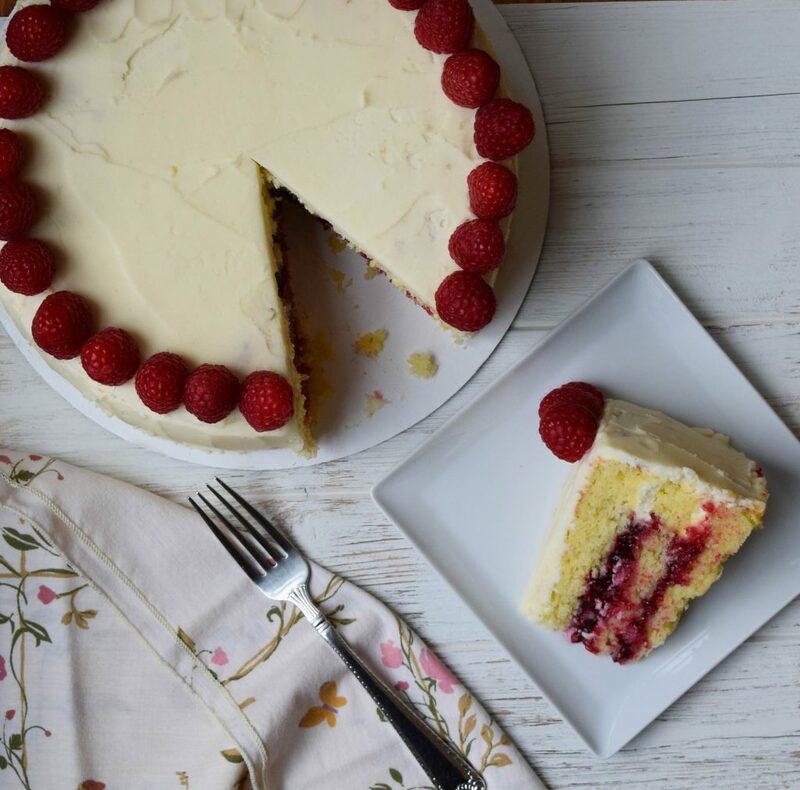 My Raspberry White Chocolate Cake is the perfect treat for your next celebration. 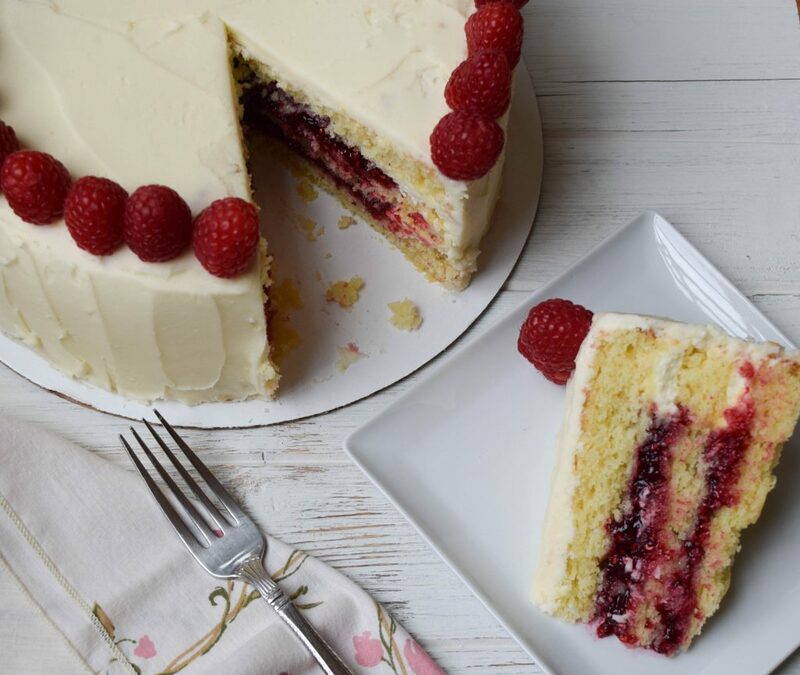 Fluffy vanilla cake is layered with homemade raspberry jam and then covered in a generous coating of white chocolate frosting. The jam is tart and the frosting is sweet for a nicely balanced flavor. Impress your friends and family today with a slice of this gorgeous cake made with Farmer Owned ingredients. Preheat the oven to 325°F. Measure out all the ingredients for the cake and separate the eggs. 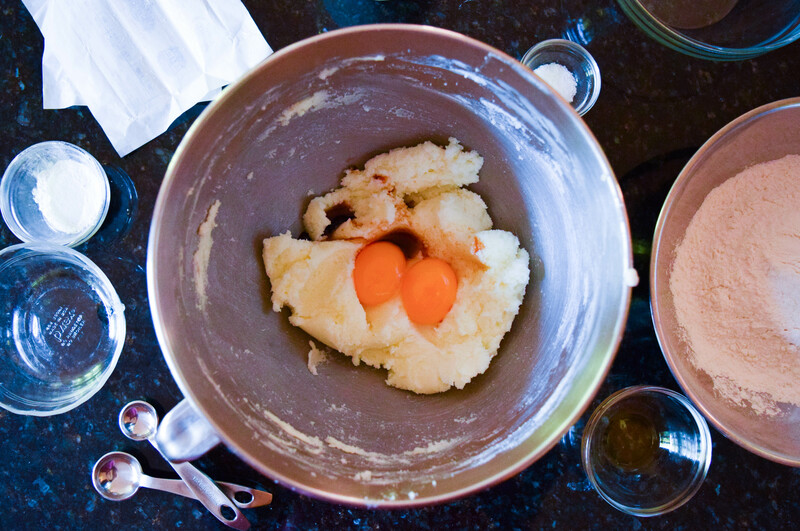 Place the egg whites in the bowl of an electric mixer fitted with a whisk attachment. 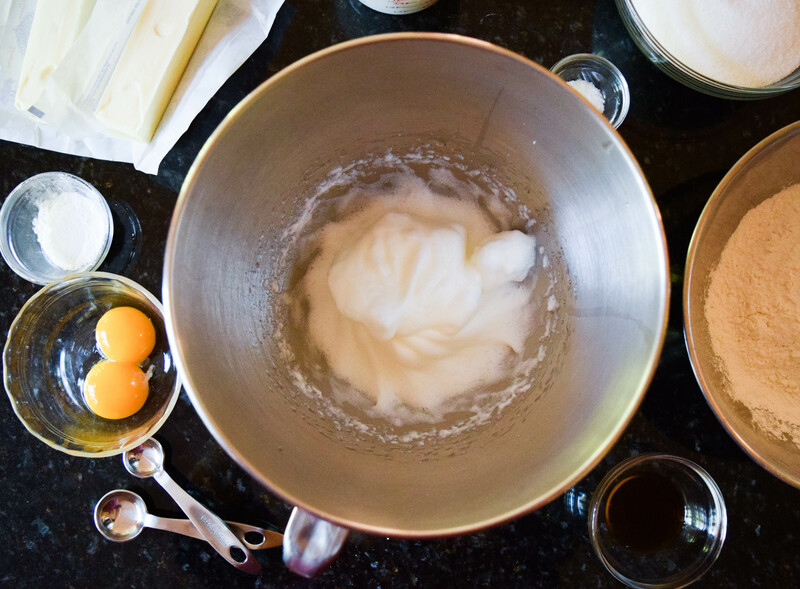 Whip the egg whites until they form firm peaks. Remove from mixing bowl and reserve. Wipe out any egg white reside and add the butter and the sugar to the mixing bowl. 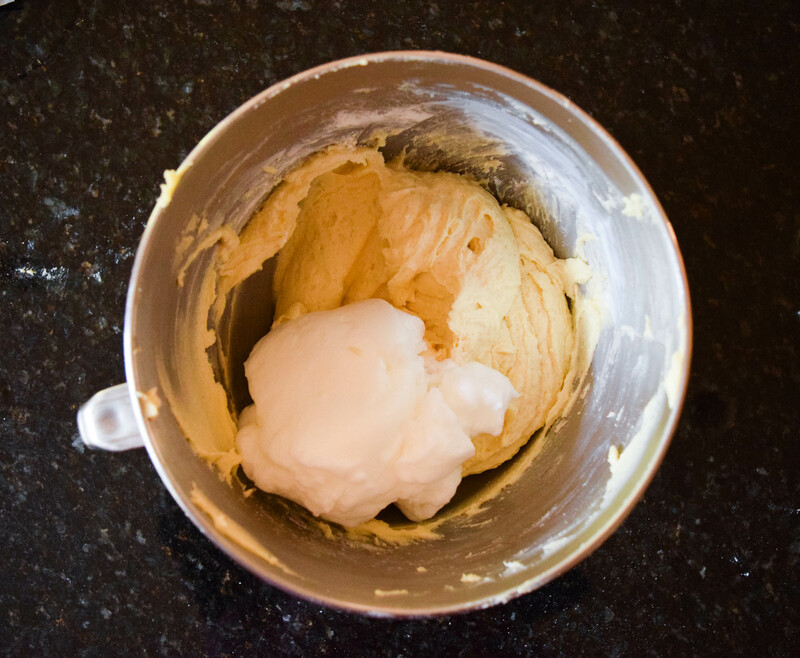 Cream until light and fluffy, about 3 – 5 minutes. Add the egg yolks and vanilla. Mix to combine. 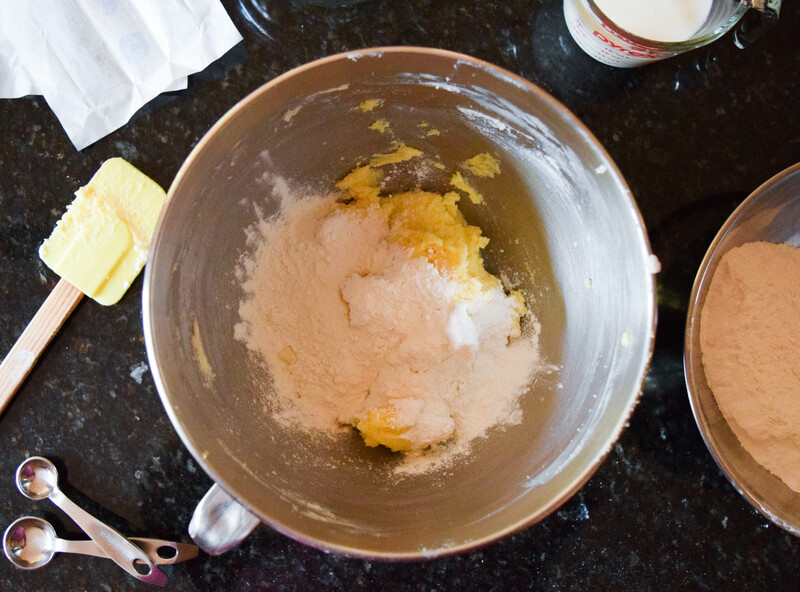 Mix together the cake flour, baking powder and salt. 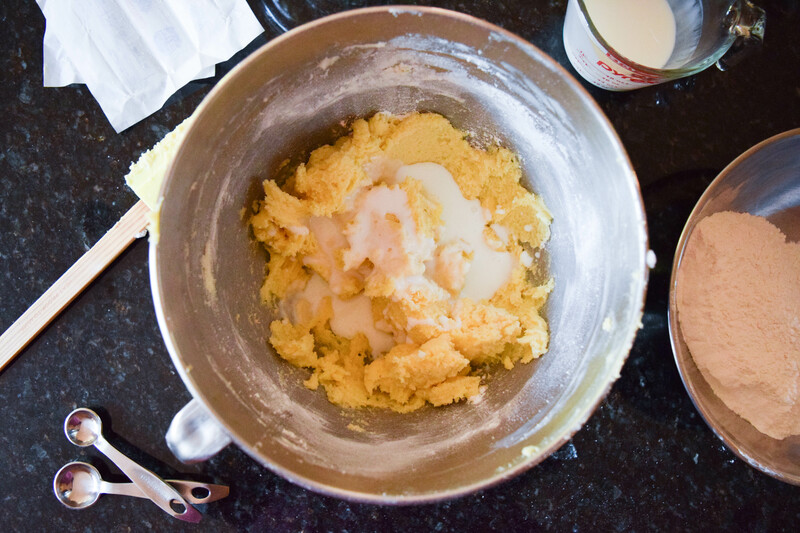 Add a third of the dry mixture to the butter and sugar. 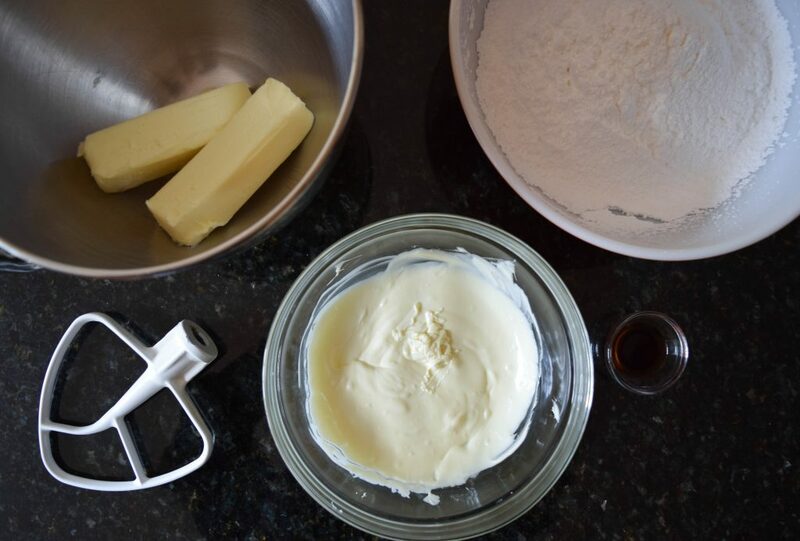 Follow the first third of dry with half of the buttermilk. Add the remaining dry in two more additions alternating with the second half of the buttermilk. To finish the batter, fold in the egg whites carefully. 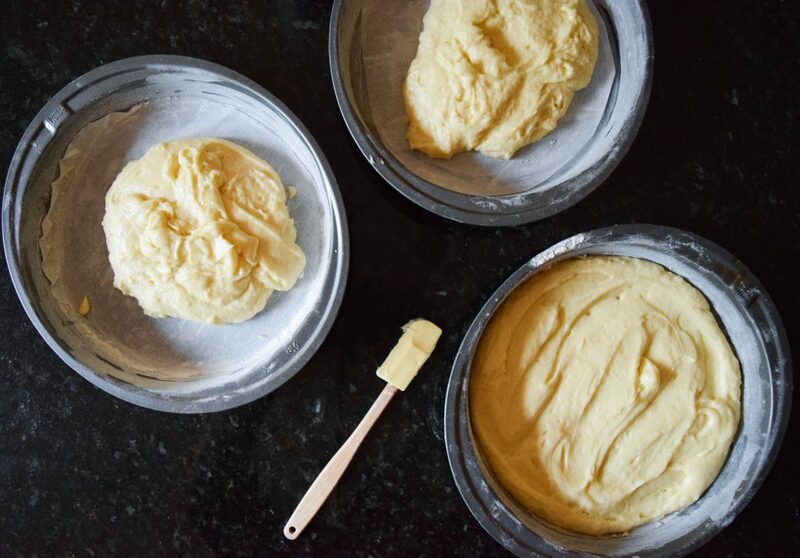 Divide the batter evenly between three 9-inch cake pans that have been lined with parchment paper, buttered and floured. 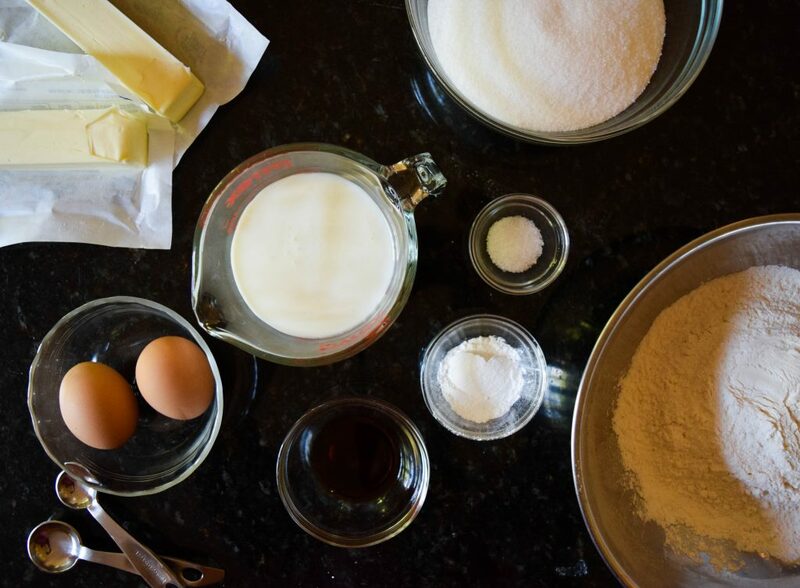 Transfer the cakes to the preheated oven and bake for 25 – 35 minutes. Rotate the pans halfway through the bake time. While the cakes are baking, make the raspberry jam. 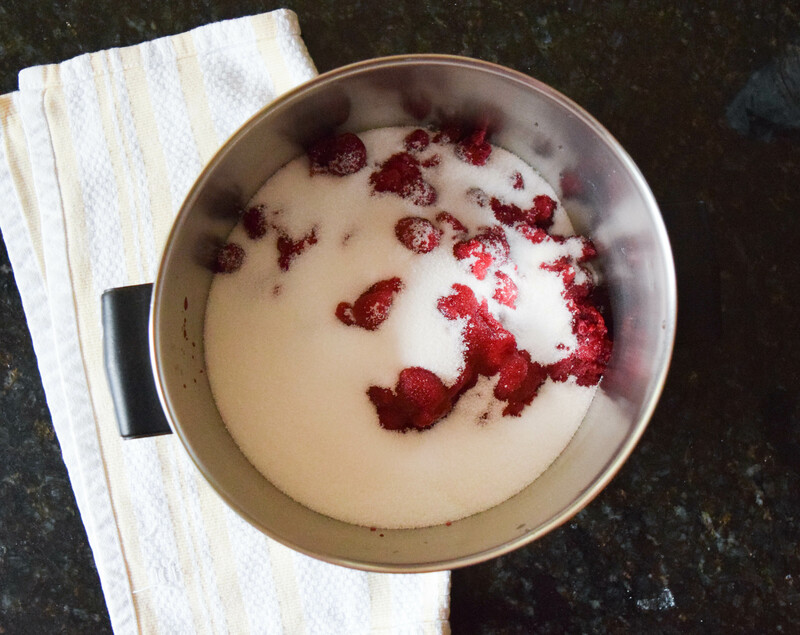 Place the raspberries and sugar in a medium pot and cook over medium-high heat. Bring the berries to a boil and boil for 2 minutes. Reduce the heat and simmer the berries for another 5 – 8 minutes until they have thickened and are syrupy. Remove the pan from heat and beat the jam with a whisk for 4 minutes. Transfer to a heat-proof bowl and cool to room temperature. Finally, transfer to the fridge to chill and thicken completely for about an hour while the cakes are cooling. While the cakes and the jam cools, prepare the frosting. 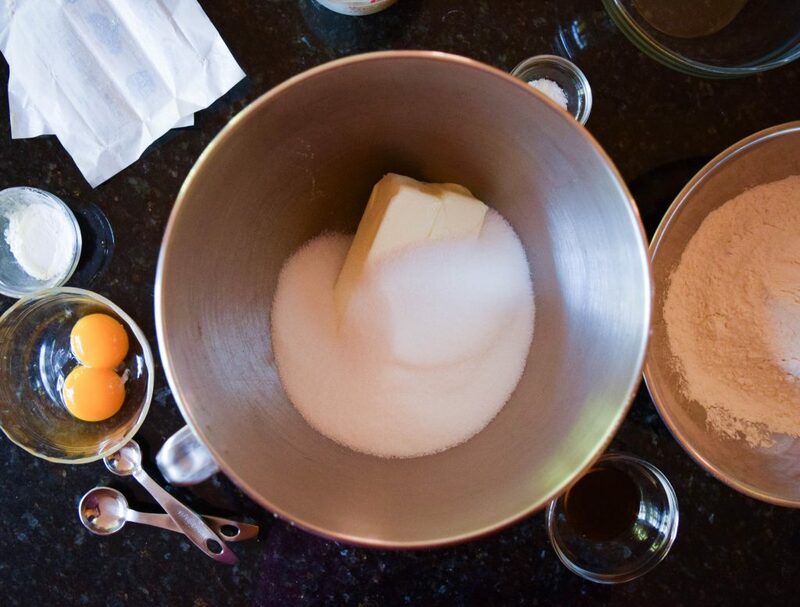 Beat butter and confectioner’s sugar until light and fluffy. Add the vanilla and salt. Slowly add the white chocolate and beat until the mixture is smooth. When you are ready to assemble the cake, remove first layer from the pan and place on a cake board or serving platter. Using a piping bag, pipe a border of frosting around the edge of the cake. 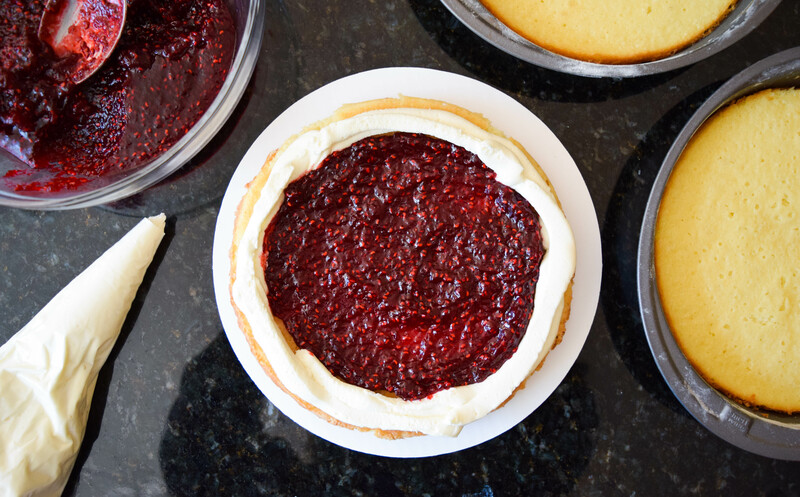 Spoon raspberry jam into the center and smooth out into one even layer. Top first layer with second cake layer and repeat the process. Finish with the third cake layer on top. 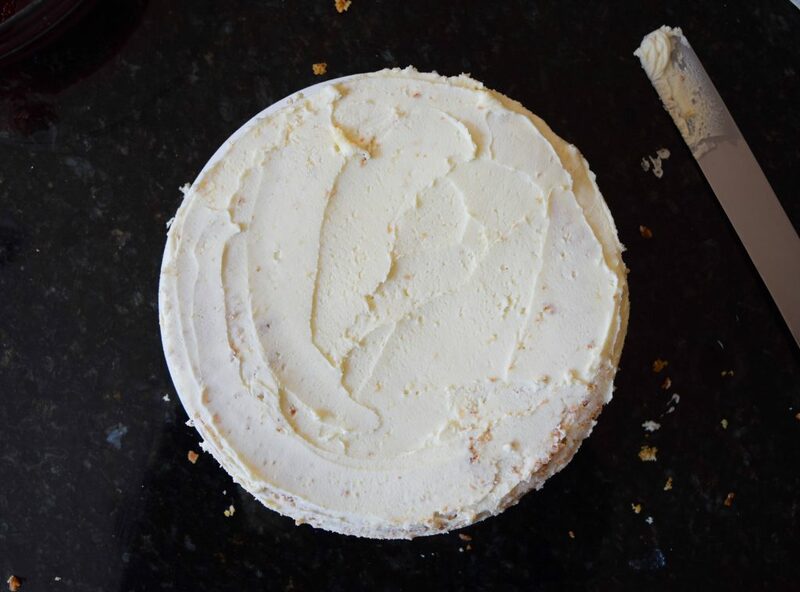 Use half of the remaining frosting to cover the cake in a crumb coat. Transfer the cake to the fridge and let set for 20 minutes. 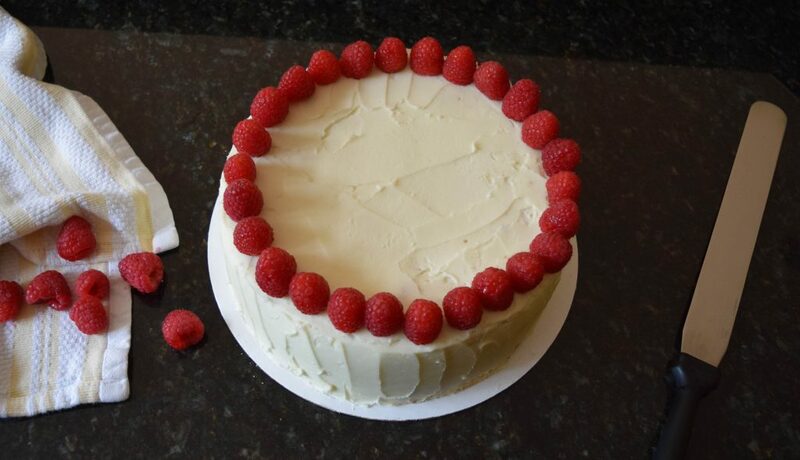 Use the remaining frosting for a smoother second layer and then top with raspberries.